I’d been skiing moderately, and badly, for years but it was three visits in as many years to the glorious ski fields of Colorado that really fired up my interest and had me determined to progress beyond my halting, tumble-prone snowploughs. The downhill journey was not, however, without some unexpected hazards along the way. I suffer from altitude sickness and some bouts are far worse than others and the symptoms can be debilitating. Constant headaches, like my skull is wedged tight in a vice and stuff into a metal bucket. At night, I sleep barely more than a half hour at a time, prolonging fatigue. I’m congested and cough up blood (sorry, I should have posted a disclaimer not to read this while having breakfast or pizza or both). I’m a mess by the end of each stay but the exhilaration of traversing those perfect snowfields becomes addictive. And this from someone with an icy disdain for the cold and the outdoors in equal measure. Yet there’s something strangely satisfying in overcoming the most basic fears of a first-timer and graduating from the beginner’s slopes to the blue runs. Not that my introduction to Vail was all that encouraging. On the first morning, our group was outfitted with skis and equipment; I was wearing borrowed ski clothes, mismatched pants and jacket that had me resembling someone who’d turned up in fancy dress at a party to find it was formal. I’d warned everybody I was a novice who was more comfortable on a gradient no steeper than the car park. At the summit of the Eagle Bahn Gondola, where the air crackled in my lungs at a height of 3100 metres, the others skied effortlessly off while I perched uncomfortably at the edge of what seemed like a deadly vertical ascent. Gravity is the most terrifying aspect of skiing for beginners. Being fastened to long slick slivers of carbon fibre, traversing even slicker snow, does nothing for the confidence. I pushed off in a knee-locked snowplough, searching for the safest and most accommodating route downhill. It took me three hours to reach the village. Without a map, I later discovered I’d mistakenly ventured into the blue runs. Over dinner, the group was horrified but said I’d looked so experienced in my ski gear they didn’t think I’d have any problems. I’m still trying to work that one out. But I kept at it. Over the course of three years, I skied at Beaver Creek, Breckenridge, Keystone, Winter Park, Steamboat and Copper Mountain. The snow was always fluffy, powdery and pristine; each night, the skies dumped fresh deep loads. On the early morning gondola rides, when the first skiers had carved out their elegant turns on the virgin slopes, and the mountain peaks glimmered in crisp air, the spectacular beauty made me momentarily forget my misfortunes. The cold can be bone-numbing if you’re not prepared. 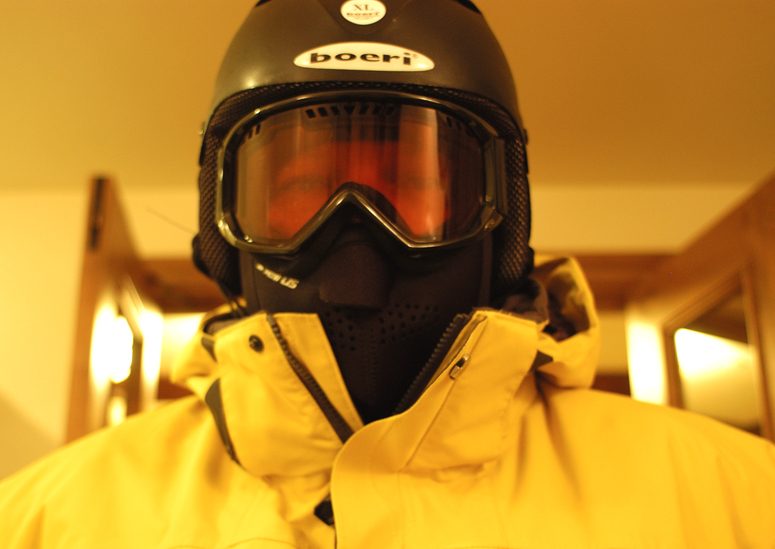 I became used to donning thermals under the ski gear, and often added a balaclava and beanie under the helmet and goggles. My own mother wouldn’t have recognized me although that may say more about my family than anything else. Most days I’d spend under the patient tutorage of instructors and a finer bunch of calm and charitable individuals could not be hoped for. Teaching me the firm fluidity of hips, knees and ankles, each working differentially to control the skis, was their ultimate goal. I made the same stupid mistakes that all beginners do but, finally, it became second nature. And I tamed gravity, although it took enormous effort. Gravity went from being my nemesis to my friend, just as the snowploughs gracefully transformed into parallels and my agonizingly careful crisscrossing of the slopes became more determined downhill runs. There were fewer embarrassing crashes as my confidence increased. Although there’s not much I can do about the altitude sickness, I’m learning to love skiing. One day, I may even be able to say the same for the outdoors. nice outfit – sooo yellow! You look like you should be putting out fires (Not a good look) but still good reading. davidlatta Create a free website or blog at WordPress.com.